Both the Presbytery of Boston and Presbytery of San Francisco have voted to divest from fossil fuels. Here's the language they used. You can ask your presbytery to divest too. Motion in November 2018: Here was the follow up motion: MOTION: Refer to the Presbytery of San Francisco's Finance Property and Oversight Committee (FPOC) a motion to place all investable assets with the Presbyterian Foundation's fossil-free funds, as a statement of our Christian calling to care for God's creation and the vulnerable people most affected by climate change. Refer to the Presbytery of Boston’s Investment Sub-Committee a motion to place all investable assets with the Presbyterian Foundation's fossil-free funds (or equivalent alternative), with an eye to diversification of sectors and an eye to cost when possible, as a statement of our Christian calling to care for God's creation and the vulnerable people most affected by climate change. In making this shift, we are recognizing that by continuing to hold investments in the fossil-fuel companies that most egregiously contribute to the climate crisis, the PC(USA) is complicit in harming God’s creation and “the least of these” who are disproportionately affected by climate change. Let us know if you start the process to divest. We want to help you in the process and celebrate your achievement. Recently I was blessed to attend a day-long retreat at Christmount Conference Center led by faith leaders and climate scientists working with the Creation Care Alliance (CCA) of Western North Carolina. The CCA collaborates with over 50 local congregations to organize events and initiatives focused on raising awareness of the importance of environmental stewardship and the realities of climate change. At this event, clergy gathered to hear Dr. Norman Wirzba of Duke Divinity School, climate scientist Deke Arndt, and storyteller Laura Lengnick of Cultivating Resilience. 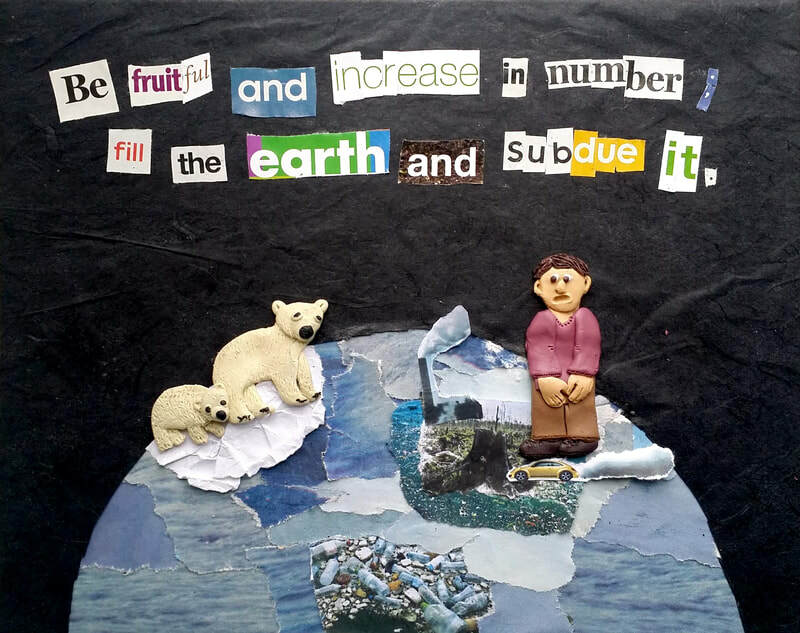 Wirzba challenged us to view the climate crisis as a crisis of our inability to practice Sabbath; to rest in the reality that God made us enough in a world led by frenetic busy-ness and consumerism. Dr. Wirzba encouraged us to practice Sabbath as a means of resisting these cultural norms, linking this call to the creation account in Genesis, as well as to the Sabbath commandments in Exodus and Deuteronomy. He also reflected on his own agricultural roots, sharing tales of the influence of his grandparents, who were farmers in Canada, and of their personal and communal commitment to Sabbath as a demonstration of their faith, even and in spite of weather events that threatened their very livelihoods. Deke Arndt, who serves as a lead editor of the State of the Climate report, then educated those present by linking climate science directly to negative shifts in economic disparity, armed conflict, immigration, and various humanitarian crises, yet the most powerful part of his presentation was rooted in his family history as well. Raised in Oklahoma, Deke had grown up as a witness to the scars of the Dust Bowl on agrarian communities in the state. He shared that because of the damage the Dust Bowl had caused to his family’s farm, both his great grandfather and his great grandmother had left Oklahoma to seek better lives elsewhere, abandoning his grandmother when she was only nine years old. From then on, his grandmother worked her entire life in order to maintain custody of her four year old sister, and she managed, but not without consequences. He grew up with a relative embittered by her own history and sense of loss; the soil was not the only thing left scarred. After listening to Wirzba and Arndt’s testimonies, Laura Lengnick invited participants to reflect on our own stories and experiences of climate change. We wrote about the first time we realized the climate was shifting and how it affected us emotionally, then shared those accounts aloud with one another. People wrote about fires and floods and shifts in seasons; they wrote about heartbreak and guilt and even enjoyment. It was a powerful witness to the way the consequences of climate change are affecting all lives, not only in terms of how the planet or the economy is responding, but also in terms of the individual psyche. In sharing our stories, it became obvious that the spiritual impacts of climate change are as detrimental as the environmental impacts. We parted ways after a brief reflection on the day’s content, but I wish that we’d had more time together. More time to hike and explore the place where we were, more time to focus on action items and share resources about next steps, more time to grow in relationship with one another. It was a gift to enjoy the beauty of the Black Mountains and to learn about the work of my fellow faith leaders who love and value the earth as evidence of God’s sustaining care and boundless creativity. I hope that we will continue to come together to strengthen one another as we work for justice for our communities and justice for our planet. In September 2018, PCUSA co-moderator Cindy Kohlmann paid a visit to a meeting of the Presbytery of San Francisco, where I’m a minister member. Giving some remarks, she reflected on the work that the 223rd General Assembly had done in June, and she acknowledged that the church still had work to do. The Presbytery of San Francisco has originated or concurred with every call for divestment from fossil fuels. Now was the time to move their own funds. At this meeting, Rev. Aho was wearing a mask to protect her lungs from the smoke from the devastating Camp Fire blanketing the Bay Area. Rev. Aho made a motion to consider divestment from fossil fuels. This motion was taken to a second discussion time at the November presbytery meeting. At that point, the motion was sent to the presbytery’s investment committee. Members of the investment committee worked with their investment managers and leadership from Fossil Free PCUSA to determine the feasibility of divestment. Presbytery Associate for Mission and Church Assets Leonard Nielson said,"After we did the research, I am sort of surprised that the vote at GA didn't go through. We can certainly be helpful in helping others to understand that this particular divestment is not as complicated or risky as it was even 12-18 months ago. The investment market is starting to offer some really attractive products due to growing demand, and we can be a part of that demand." At the February 2019 presbytery meeting, the committee recommended divestment from fossil fuels to the presbytery, saying that such a motion would be in line with the presbytery’s commitment to faithfully care for the earth, that divestment could be done quickly and efficiently, and that the reinvestment in renewables would not significantly affect the presbytery’s bottom line. The recommendation was approved on the consent agenda, unanimously. After the vote, we held an open-space conversation, where members of the presbytery could ask questions about divestment. Participants shared their worries about climate change, talked about the fossil free options offered by the Board of Pensions and the Presbyterian Foundation, and wondered how to begin organizing for categorical divestment from fossil fuels as a whole denomination. I facilitated that conversation, my head and my heart wrestling with how we help our beloved denomination see that we must love creation with our whole selves, even our investments. A motion to divest from fossil fuels was made on the floor of presbytery. That motion, affirmed, was directed to the investment committee. The motion had a second reading/discussion time at a presbytery meeting. The investment committee met with their investment managers, who offered several investment solutions. The investment committee, determining that divestment from fossil fuels would be a powerful witness to the care of creation and would not harm the investment portfolio of the presbytery, determined that they would begin the divestment process. The Presbytery affirmed that decision at their presbytery meeting. Time for the annual letter. First, I hope you are well. It has been a year filled with joy and sorrow. May was a great month with a few fundraisers in the park and the Girl Scout meetings. I really enjoyed the pick-up soccer games this summer. Sadly, Marley Maple died in October and it was sad to see her go. ​Over the last month, I have watched the celebrations of the holidays, the Christmas trees, lights, and garlands, and heard the festivities of music and laughter. Through the windows I could see friends and families gathered together. Food shared, presents opened. There were a number of parties at the Elk’s club and Santa drove to a few houses. Though it was wonderful to see smiles on many faces, I did notice the abundance of trash outside the week after Christmas. Seems like everything is wrapped in plastic. A kid was walking by the other day and unwrapped an apple from a plastic wrapper. Seriously. I’m not joking. I told my friend Charlie to tell Johnny about it. Johnny wasn’t happy and complained that he spends a lot of time tending apples; they have their own wrapper. But I digress. As New Year’s approached, I was privy to a few conversations of those walking together or on their cell phones of plans; both for the parties on the eve and the resolutions. Of course, I heard many people say that they want to lose weight, eat healthier, exercise more. I did hear one woman declare that this was the year she would read the stack of books on her nightstand. While reading over the shoulder of someone on their tablet in the park, I read an article that said by January 17, most people have abandoned their resolutions. I’m not sure how scientific the article was but it seemed about right. During the last few weeks, the temperature has been all over the place – from 58 to 12. Sure, we often have a few warm days, but no one seems particularly concerned that we have 58 degree days in December and have been experiencing the temperature gauge ping-ponging every day. I’m no climatologist but I have been around for about a 100 years and it used to be like this: it would get cold and stay relatively cold in the winter and the ground would freeze hard. We haven’t even had consistent freezing temperatures at night. This weather confuses me and makes my limbs ache. Radios tell me that people are getting more committed to the environment, organizations and churches are getting involved to save the earth. I’m glad to hear it but I’m not sure the radio gets it right. Plastic got tangled in Mrs. Williams tree a few months ago and no one has removed it. Jane says she is suffocating though she tends to be a bit dramatic. My guess is, it is uncomfortable and heartbreaking. When did kids stop climbing trees and start ignoring plastic hanging from it? Why doesn’t it seem to matter? I firmly believe in God – she did create me after all. I also know that all my friends believe in God and we take our jobs as creation seriously; we are here to provide shade, oxygen, beauty, fruit, wood, and love to humans. I guess my hope for this year is that humans would believe in God and in their jobs to care for creation. I don’t have thumbs so I can’t write our elected officials, I can’t march in protest, I can’t really do much to help. But I have stood here for about 100 years doing what I can to provide a respite for all those who are trying to help. I’ll be here all winter, spring, and summer if anyone needs me. I’ve got a few things to tell you if you can stop long enough to listen. So, I guess this year I’m asking that you please try to save me and my friends. We love you and see you; do you love and see us? A good start would be to support the Fossil Free PCUSA group. They had a 5K in my park last year and I got to witness their work. They are trying to save me – and all of you – because they love God, and all creation, and all of you. Epiphany is a celebration of the light of Christ, disclosed to us in the story of the magi coming from lands far away to worship the newborn son of God. During epiphany, we remember God’s promise that light will overcome darkness, even in the midst of surrounding chaos, such as with the devastation of God’s creation here on Earth. With increased pressure on migrant populations attempting to cross the U.S. border due to a merging of economic, social and environmental concerns in their home nations, we remember God’s promise that light will come through the glory of the Lord. 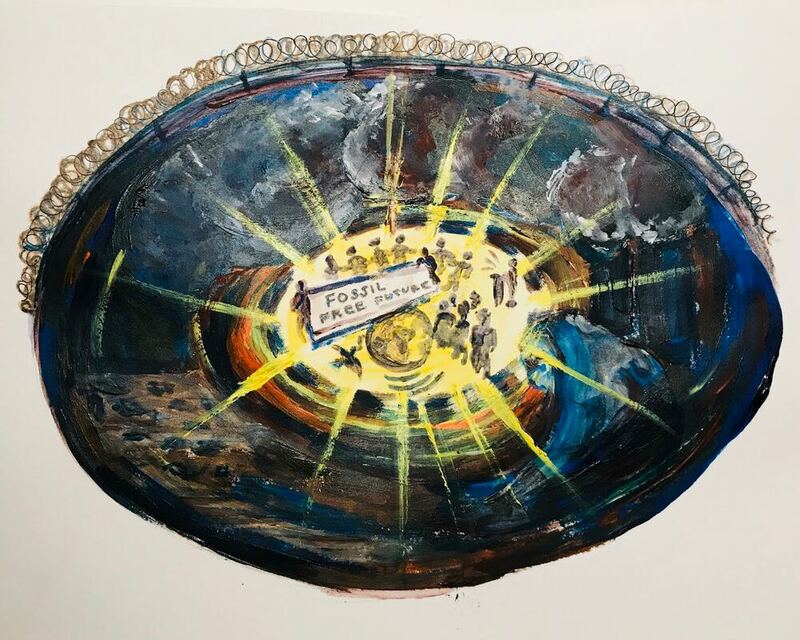 This painting depicts various forms of destruction to Earth’s environment with border wall fencing along the top, yet the work of the Spirit shines through this chaos through the work of communities such as FFPCUSA. In the midst of chaos, Epiphany reminds us to sing praise that representatives from FFPCUSA and the Presbyterian Peace Fellowship were able to walk over 200 miles to the General Assembly this past summer, meeting with frontline communities, faith leaders and scientists on their journey who taught them more about dangerous threats to creation and how nonviolent action can help address these threats. We sing praise that these siblings in Christ were able to share God’s witness to push for action to address climate change with commissioners and delegates at the assembly in St. Louis. And with the stars of a new calendar year, we sing with unbounding hope that in the midst of chaos here on Earth, God continues to show up. We sing our praises as, together, we attempt to do the same. Emma Warman is an artist, seminarian and member of the Activist Council of the Presbyterian Peace Fellowship. ​Happy New Year to one and all. Each new year gives us opportunities, blessings and challenges. And in some ways, a new year is like a new beginning, an opportunity for us to decide to do things differently with our lives. This is such a year—and we need that opportunity right now. My home in Florida area was slammed by Hurricane Michael in 2018. What you may not know, now that our story is out of the headlines, is that we are still recovering and that, for some, the recovery will take decades. And what many don’t know is that we will face more, and more violent, storms in the years to come. Today, blue tarps are still covering many of our rooftops. Our friends and neighbors are still rebuilding, arguing with insurance companies, filling out papers for FEMA, sleeping in tents, and depending on the charity of friends and neighbors for places to sleep. Many jobs have been taken from us, too. One of the most devastating and long-lasting impacts of Hurricane Michael is the destruction of timber farms. From the Gulf Coast up through South Georgia, hundreds of thousands of acres of trees are lying on the ground. More than half a million acres of trees in Bay, Calhoun, Liberty, Gadsden, Jackson and Gulf counties are gone. With this loss goes jobs, income and diminishing chances of recovery any time soon. This is a monumental tragedy that is painful and life changing for far too many of our brothers and sisters. None of us wants to repeat this tragedy, but as long as the waters of the Gulf of Mexico continue to warm, they are guaranteed to fuel ever more powerful hurricanes. This is our new reality. Our world has changed and will not change back until we alter our own choices. When we face a disaster, our church is first in line to help us recover. But it is last in line, or not in line at all, in embracing the new global reality. It continues to invest in fossil fuels. For decades it has committed its investment managers to meetings with fossil fuel companies—and these companies keep spending hundreds of millions of dollars to convince us that they are not responsible for our climate crisis, that fossil fuels have nothing to do with the carbon emissions that are heating up our world. Most of us know that this is a big, dangerous lie, but still we have not rid ourselves of our fossil fuel investments. Our church’s response to climate change is like living in a two-story house with the heat running on the lower floor and the air conditioning running on the top floor. This is stupid. We are funding the monster called climate change and at the same time we are paying for the damage it is causing. It is time to get on the same side of the ledger by divesting ourselves of our fossil fuel holdings now. As we start this a new year, we can rid ourselves of our investments in fossil fuels. We can take a life-saving, planet-saving path. We don’t have to wait to make this decision at the 2020 General Assembly. Our money people can make this choice today. Pam McVety is a grandmother, biologist and member of Fossil Free PCUSA. Christmas: Let Us Walk in the Light of Life! The Son of God came into the world in a dark time when there was no hope under the rule of the Roman Empire. The great salvation project for the humanity of the omnipotent God began with the baby Jesus, who was born in a small village of Bethlehem, The Messiah to save this sinful world Christ began not in the form of a great king with powerful kingship but in a place where he was born and had no proper place to sleep. A light came to the world that seemed to be just a little life. Worries and sighs about climate change are increasing day by day. Each year, we are renewing the highest temperature in the world. We are probably living in a time when the worst earth is suffering. I feel it is impossible to stop this huge flow of climate change. I feel like that I want to avoid the responsibility of not managing this beautiful earth that God gave us. But we cannot. Nothing is changed by worrying and sights a lot. We should act whatever we do. Changing begins then. If God just had loved and worried the world, salvation history would not have been accomplished. It was only begun and completed because God sent Jesus the light to the world. We can be frustrated with how I can stop this huge flow of climate change with my own efforts. But one person is important. Walk a short distance and ride a bike a little further. When cold, not turn the heater all the way around and wear short sleeves, but wear a minimum of heaters and multiple layers of clothes. When it is hot, let us thank the cool air with a minimum of energy and cold water, not just wearing a cardigan over the air conditioner. When going to the market, carry own shopping bags, not using lots of plastic bags. Although my effort and action are small, it is accumulated and communicated to other people and act together, this one can be gathered, piled up, can be a starting point to stop the huge flow. We must fight the ones we are accustomed to. We must choose the uncomfortable ones. Day by day. Little by little. We must go one step forward. The work of salvation of God also began there. From in a manger where baby Jesus laid down. God's amazing plan was perfect, and the plan of salvation continues today. The light of the salvation of one of Jesus is to twelve disciples, leading to the Early Church, to Judea and Samaria, and to the ends of the earth. Let us talk to those who say there is no hope. We are hopes. We are the little Jesus. It is Christmas to celebrate the birth of baby Jesus as a new sunrise tomorrow. Let us pledge that we will be reborn with Jesus as the rising sun. Join the work of God 's salvation and live a life of light in this darkened world. Let us go on believing that the little lights of each person will gather and together to become a great light to illuminate this darkness. I wish I was home for Christmas. Home means eating cinnamon rolls made by my mom, playing with my nieces and nephews, meeting up with friends we haven’t seen all year… Home means getting to have cheese fries at my favorite restaurant and hugging my partner’s 80 year old grandmother who I love like my own. But earlier this month, my partner and I travelled to the Mexico-Texas border to meet and support (in our own small way) asylees who have left their homes to come north. We went with the PCUSA Wall of Welcome, joining students from Austin Seminary and leaders of the PCUSA. We went to listen and to learn. We went because we felt it necessary to leave our homes in order to welcome those who had journeyed so far in order to be welcomed. I’ve been thinking about that journey in the context of Mary and Joseph’s journey to Bethlehem--how they sought welcome and ended up in a stable. How from the stable, Mary and Joseph--and now Jesus--had to flee because if they stayed their son would be killed. How their flight meant that other babies were killed… and that at the end of the day it was Herod who bore the guilt. In the same way, our governments today enforce systems of all kinds that mean children--and other living things--die. We went to the border to meet real human beings who had fled their homes in search o life. But going to the border (and another family trip in the spring) meant that we used up our resources to go home for Christmas. I don’t just mean our financial resources, though we don’t have limitless money. I mean also that we used up our carbon emissions budget for the rest of the year. Everything we do has a carbon footprint. In our household we’ve tried to make ours smaller by investing in the solar power option from our utility company, having one of our cars be hybrid (and driving our cars as little as possible), eating an all vegetarian diet (though my partner sometimes eats meat outside of our home), buying only what we need, investing our time and money into advocating for divestment from fossil fuels, and putting on a sweater when we’re cold instead of turning on the heat. But every time we fly, we make that footprint larger. I fly often for work and I have had to face the guilt of the fact that every time I buy a plane ticket, I’m contributing to climate change. And climate change is literally killing other human beings right now. I don’t know how to stop flying for work--not yet--and it is the question I’m bringing into the New Year. But knowing that--we need to make our own sacrifices. So on Christmas Eve, I’ll make a phone call home. I’ll laugh with my grandmother and listen to my niece sing to me over the phone. I’ll pick up cinnamon rolls made by my favorite local baker and snuggle up with my cats. And as the night grows deeper, I’ll give thanks for the Little One who is coming into this world to love us and teach us and help us make home wherever we go. ​I remember the first time I ever loved a place. I was flat on my back on a tennis court at Mo Ranch for vespers during Senior High Youth Celebration in a circle of new best friends, and we were singing beneath as many stars as I’ve ever seen all at once. I had been to Mo a few times before, but that night I understood what people mean when they talk about having more than one Home. The Texas Hill Country is one of the most beautiful places in the world, and Mo Ranch is right in the heart of it on the Guadalupe river. It is verdant and rocky and vast, with a chapel and a labyrinth and a defunct roller skating rink where we did energizers and heard amazing ministers talk about God in new ways. It is on lands that once belonged to Lipan Apache and Comanche people. I didn’t know that back then, but it is important to know it now and to pray and fight for displaced peoples of all nations. The place we now call Mo Ranch is carefully preserved and set apart, which is why it’s possible for a tennis court full of high schoolers to see all those stars. That night, I committed my heart to that patch of land, and I have been back many times since. As we wait expectantly for the birth of Jesus this Advent, I think about forgotten lands. I think about corners of the earth that no one with power or money has committed to loving deeply. What would it be like if I could transform the love I have for Mo into an abiding devotion to every inch of this good, created Earth? How can we open our hearts to to caring for the whole planet the way we love our Homes? I don’t have an answer to those questions, not today at least. But I know we don’t have much time left to ask them. As we wait for Christmas and wonder at the love our creating God has for us, let us also wonder how we can show that love to the soil and water and air that keeps us alive. Maybe not a conventional opener for a reflection on joy in nature, but I’m not sure one can actually experience joy in nature. At least, not outright. I’ve come to believe that nature uncovers joy in innumerable ways but can’t deliver us joy like a small wrapped gift floating on a lily pad that we happen to stumble upon. Is this making any sense? I’ll try my best to explain. As I’ve been considering the idea of Joy in Nature, I’ve been led to consider the nature of joy. I agree with most folks, there’s something radically different about joy and happiness. I think that while happiness is an internal emotional response to external stimuli and sort of comes and goes as we move from one set of circumstances to another, joy is an experience that principally begins within. Put another way, I think happiness moves from large-scale to small-scale. We each experience and process information outside of our bodies (that incredible chocolate cake from yesterday, the thoughtful text from your far-away friend, the hilariously misspelled headline), and sometimes these things reduce to a feeling of happiness within. When it comes to joy, our awareness of it moves from small-scale to large-scale, its inception springing forth from within and then moving us toward a sense of those things larger than us. Most simply put, joy is the experience of our central fulfillment. Joy is present when we feel our complete wholeness, when we experience our undeniable interconnectedness to one another, and when we are delivered to wonder at what is before us and the possibility of what may come next. And, in this way, the unexpected, almost always temporal, and frequently unimaginable way, our natural world reveals joy and thus makes us aware of God within each other. A few weeks ago, I took part in an unlikely kickball game that uncovered joy for me. This kickball game took place on one of the last bright and sunny Saturday afternoons of the fall in a public park located in a city neighborhood hurting from the effects of redlining and poverty. It was just cold enough to need a jacket during the team dividing but warm enough to shed a layer after running the bases a couple of times. The athlete roster was a holy mix: adult staff from a nearby non-profit, neighborhood kids, youth from a church hundreds of miles away, and middle-aged and older members of a nearby suburban church. And while some of us were on the kickball field, another group of new friends was sitting at the park’s tables doing some coloring and getting to know each other. As I ran and played and enjoyed the warm sun and still crisp air, I was equally struck by the beauty of the day and how unexpected and ephemeral this moment was. Innings would end, winter would soon arrive, the leaves would fall, this temporary community would disperse, and we’d each return to our home. This moment revealed for me such a sense of joy. I deeply understood my connection with these people I’d just met. Now, weeks later, I remain convinced that heaven looks something like an unlikely kickball game on a beautifully sunny day. Surely, the presence of our Creator was in that place. As we notice joy arise within us during this advent season, may we especially take time to notice and mark the ways that your creation holds, clarifies, and guides us to an awareness in which joy is uncovered. Accompany us as joy is revealed through these unexpected, perhaps temporal, sometimes unbelievable glimpses of you, The One whom we turn to and remember when a great joy is felt. Renew in us the curiosity to notice joy. Amen.